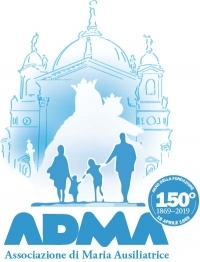 (ANS - Rome) - The Association of Mary Help of Christians (ADMA) will celebrate its 150th anniversary on 18 April. It was established in Turin on 18 April 1869 through the work of Saint Giovanni Bosco, the year after the consecration of the Church of Mary Help of Christians (June 9, 1868), as thanks for the benefits that people recognized to the Virgin and as a tool for the defense and growth of the faith of the Christian people. The inspiration that moved Don Bosco was to offer a proposal for a simple Christian life that would sustain the ordinary life of the faithful, anchoring them firmly to the "two columns" of the Eucharist and of Mary, Immaculate and Help of Christians. In the message sent on the occasion of this happy anniversary the President of the Primary ADMA of Turin-Valdocco, Renato Valera, said: "The coincidence with the liturgical date of Holy Thursday invites us to live this anniversary with a Eucharistic spirit. As we give thanks for these 150 years of life of the Association of Mary Help of Christians, let us commit, faithful to the charism of our holy founder Don Bosco, to letting ourselves be guided by the Holy Spirit for a renewed evangelizing and educational impulse." "It is about living and bringing faith in Jesus Christ and love to Mary to many friends, family, colleagues, neighbors, acquaintances," continues Mr. Valera. "The essential part of this evangelizing impulse consists in renewing the Association with a privileged attention to the family and to the new generations, favoring and taking care of personal friendship, openness to all and the spirit of service, making the deeply evangelical attitudes of Mary our own: her availability to God, her faithfulness in the hour of trial and of the cross, her spirit of joy and thanksgiving for the marvels that the Lord works." More specifically, the 800 groups of ADMA aggregated around the world are invited to plan, for Holy Thursday or at another time, a time of Eucharistic adoration in which to renew, with Mary, faith in Jesus Christ and the commitment to be joyful witnesses of the new life of the Gospel. (ANS - Palabek) - More than 4 million people have been forced to flee their country and nearly 400,000 have died as a result of armed clashes, but also of diseases and food shortages. These are the frightening statistics of the civil war in South Sudan, the world's youngest country, independent for just eight years, but still without peace. Thousands of people have no choice but to flee, and many take refuge in Uganda. Among these terrifying numbers, a young mother struggles to survive: her name is Gladys and she has a son. Gladys is a 23-year-old woman who immediately draws attention by her height, her hair, her beauty and a smile that always appears on her face. To render her even more special is the fact that she is the only woman attending the Motorcycle Repair Course at the Don Bosco Technical School in the village of Palabek, Uganda. She attends the course with dedication, but outside the school she also works with a small sewing machine, making small repairs, and as soon as she can she rides her motorcycle to South Sudan to visit her mother and son. The dream of Gladys does not differ almost in any way from the dream of other refugees in the settlement of Palabek: peace. But until peace materializes, the long and difficult day in the field is full of little dreams, such as education, activities with Salesians and motorbike trips to South Sudan to visit her family. Gladys fled from South Sudan when she understood that staying put could mean being killed at any time, and her will to live overcame the fear of migration. "One day they shot a bus full of people and I managed to throw myself to the ground and survived, but many people died," recalls Gladys painfully. Gladys is the example of a refugee, young, a woman, mother and a survivor with incredible strength. 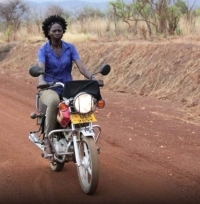 She knows how to ride motorcycles and wants to become a professional driver to travel assiduously in South Sudan. Thanks to the Don Bosco Technical School, opened by the Salesians just two months ago, she attends the Motorcycle Mechanics Workshop. "I don't care that I'm the only girl; for me it's clear that I have to know how to repair the motorbike in case it breaks during the journey." Gladys' dream continues in her son. "I want to give him a good education," she says. She also hopes that one day it will be possible to have a definitive peace "in order to be able to think about the long-term future" and to be able to continue smiling at life, without having to worry about how much time she will have to stay in a refugee settlement. (ANS - Jorhat) - Educating young people, especially those most at risk of social marginalization, according to the Salesian perspective means equipping them with the tools to develop as human beings and citizens, both spiritually and professionally. This is why from 5 to 8 April, 75 young Mising indigenous people took part in a training course promoted by the Institute for Culture and Rural Development (I-CARD), founded and directed by Salesian Fr K.A. Thomas, who contemplated both dimensions. The young people, from the districts of Golaghat, Sivasagar, Majuli, Dibrugarh, Charaideo, Lakhimpur and Dhemaji, in the Indian state of Assam, attended an introductory session led by two officials of the “Gas Authority of India"- Puspalata Kardong and Bipul Taid - who spoke to the children about the need to have a positive outlook on life, to listen to their inner life and to cultivate spirituality. "Give prayer a chance" the two interlocutors recommended. In the morning of the following day, after a moment of meditation and another of social work, the whole group reached the Agricultural University of Assam, where they attended a lesson/laboratory session, both theoretical and practical, on raising pigs, in which the effectiveness and value of integrated breeding of pigs, fish and poultry was emphasized. In the afternoon, at the I-CARD facilities, formation continued through a session on government schemes and projects on pig breeding. In this phase, Fr K.A. Thomas was also able to illustrate to the young indigenous people the Japanese technique "Bokashi" used at the institute's farm, which combines productivity and respect for nature, while also improving the quality of the air. On the third day, the participants in the training course worked on various activities of public utility within the I-CARD campus, and then, in the last two sessions, completed technical training in pig breeding - discovering how to prevent diseases among pigs, which drugs to give them - and receiving valuable information on their own individual health and hygiene as well as on the rights of each person. On this last occasion, Fr K.A. Thomas focused mainly on domestic violence and insisted that young people should proceed with courage and determination to stop these abuses and give dignity to all members of their tribes. During the course, each evening was animated by lively presentations and cultural programs to which all participants joined with joy. "It was more a party than a training course," one of the young participants said. And in fact, even some young people who had initially come to participate for just one day, then attended the entire course. At the end of the last session the young students were awarded their graduate certificates. 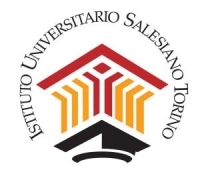 (ANS - Turin) - The Salesian University Institute of Turin-Rebaudengo (IUS-TO) doubles its efforts to people in financial difficulty: in fact, the free "SU.PER.A il GAP" help desk (Support to People Facing Pathological Gambling; overcome the gap, the acronym), established in 2015, now expands its focus and also includes over-indebtedness: this is the first free branch managed by a university, and intends to offer support to people who have ended up in the downward spiral of debts. Over-indebtedness is a growing phenomenon in Italy, and is not only related to gambling. It may depend on many factors, such as job loss or difficulties due to unexpected expenses, perhaps to deal with medical care. In these circumstances, many people find themselves not knowing how to manage nor to whom to turn to to pay their mortgage, bills, loans ... And there are those who – as a solution - come to contemplate turning to usurious loans or even suicide. The statistics confirm this expanding emergency: in 2017, almost half of Italian families said they had problems getting to the end of the month, when salaries are paid in Italy, and 28.7% of them had to apply for a bank loan to cover their expenses. But loans are not always granted and for this reason 12% of these families resort to loan sharks, thus entering a vicious circle. It is to stem this phenomenon that the IUS-TO has established its own branch within the University Library in a city area particularly affected by these problems. The IUS-TO Help Desk is offered and manned by ad hoc trained volunteers, including graduates in Psychology from the same institution, and is supervised by clinical psychologists; in the case of foreign users, the support of intercultural mediators is also provided. It first offers people with dependency or over-indebtedness, and their families, a first reception and psychological support; then it encourages contact with specialized structures. "The choice to open the 'Supera il GAP' HelpDesk is part of a precise idea of a university that we want to achieve ... So that the university produces and spreads science and culture, not only from authoritative studies and research, but also from from intelligent and supportive listening of the multiple 'worlds' in which people find themselves," explained prof. Alessio Rocchi, Director General of the IUS-TO. In addition, the IUS-TO, as part of the "D.REA.M.S" project, also offers courses and workshops focused on the consequences of gambling. “The young are called to make constant choices that give direction to their lives; they express the desire to be heard, recognized, accompanied. Many find that their voice is not considered interesting or useful in social and ecclesial circles.” This is one of the conclusions made by the participants on the Assembly of the Synod of Bishops in October 2018. The Catholic Church has focused her attention on youth in the last two years in the process known as “Synod on Youth, Faith and Vocational Discernment”, through a very participatory approach. The Synod has allowed Catholic bishops and other Church authorities to take an attitude of careful listening to young people, gathering their aspirations and dreams, in order to help them take life choices in different fields of their life. Young people have been involved and present at all stages of the Synod. Don Bosco International and COMECE, in their capacity as religious actors in contact with the European Institutions and other stakeholders, intend to analyze this process from a socio-political perspective. How can youth, including young Catholics, respond to this call of engaging in a more challenging social and political environment? Together with different participants in the Synod Assembly, young Catholic leaders, policy-makers and other active stakeholders in the field of youth, they will try to give continuity to the Synod of Youth in the heart of Europe. The first moment of the appointment on Thursday 11 will be a dialogue between the President of COMECE, the archbishop of Luxembourg, Msgr. Jean-Claude Hollerich, the bishop of Ghent and President of Caritas Europe, the Salesian Msgr. Luc Van Looy, and Annelien Boone, a young Belgian who took part in the Synod. In a second moment, they will reflect on “possible synergies between EU policies on young people and the Synod”, with speeches by Fabienne Metayer, Head of Youth Policy of the European Commission, Lukáš Pachta; assistant to MEP Michaela Sojdrova; Katharina Norpoth, President of the Bdkj, German Catholic Youth Federation. Furthermore, some concrete examples of the socio-political commitment of young people will be presented. "At the Synod Pope Francis said that rather than working for young people it is necessary to work with young people, to enable them to fully realize their talents and aspirations in their local community and to strengthen them at all levels of social, economic and political life," summarized the organizers. If you want to join us, please register here until today, 9th April. In places like Algeciras, Morón de la Frontera, Alicante, Malaga, Cadiz, Ciudad Real, Cordoba, Jerez, Mataró, Huesca, Elche or Palma del Río, just to mention a few places, traditional processions will take place from 12 to 21 April with an approximate number of 30,000 adherents. As a corporation born within the Association of Past Pupils, the Malaga Brotherhood has, for example, expressed its marked Salesian character. Its apostolic impulse, service to people, the simplicity of the celebrations, the desire to be present among the young and humble families, work, initiative and profound Marian devotion are all aspects proper to Salesian spirituality. "For all these reasons, on June 20, 1996, the then Provincial, Fr Eusebio Muñoz Ruiz, gave the title of Salesian Brotherhood and with the desire to deepen the commitment to young people." This desire to expand the sense of confraternity is what has encouraged the process of creating the Provincial Council of the Salesian Brotherhoods. "The Salesian Brotherhoods are represented by an advisory and organizational council, reporting directly to the delegate of the Salesian Family and then to the Provincial. The Coordinator also belongs to the Council of the Salesian Family of the Spain-Mary Help of Christians Province," explains Manolo Orellana Delgado, Coordinator of the Brotherhoods. The full life of the Salesian Confraternities is not limited solely to a season of penance during the week of the Passion or to the triduums and cults of Lent. It is worth emphasizing that, in their daily lives, they animate many different initiatives, which are centered on social work, solidarity campaigns, the collection of school materials, toys, food or clothing, as well as paying attention to the people received in nursing homes, schools or associations. Such are a few small examples of the full life of these Salesian brotherhoods, a reflection of the charism of St. Giovanni Bosco. The celebration featured several speeches through which the history of the CCS was recalled, that the publishing house was born by the will of the then Rector Major Fr Pietro Ricaldone, IV Successor of Don Bosco, who wanted, like Don Bosco, the "publication of good books". He wanted the books published by CCS not only to be texts lasting over time, but above all to contribute to education and faith. It was under his impulse that in 1944 the SEI (Sociedad Editora Ibérica) was born, which in 1994 took the name of Editorial CCS. Besides the commemoration of the past and the progress made, there was also recognition paid to those who have shown depth and intellectual rigor, leaving traces of their thought in the work of the CCS, whether they were Salesians or lay people. Furthermore, as a prelude to the celebration of this anniversary, the organizers had launched a drawing competition for all the students of the Salesian schools in Spain, entitled "Imagina a Don Bosco hoy". Launched to make Don Bosco's presence in today's world even more alive, for the organizers it was "a sign of the appreciation that the figure of Don Bosco continues to have, as it had a great response, with almost 4,000 participants." Of note, one of the winners of the competition was Bianca Scurtu, a student of the Salesians of Zaragoza. The presence of the Rector Major at the Madrid appointment was of great importance. In his speech he recalled Don Bosco as a great communicator and great writer of books for his young people. At the same time, he thanked all the Salesians and lay people who have worked and continue to work at the CCS, and in a special way to José Luis Mena, a professional photographer, creator of significant projects and a Salesian who produced beautiful photographs of the last four Rectors Major. Having completed its first 75 years, the CCS continues to be valid and current not only in Spain but in the world, through an editorial production at the service of education and faith. PARA sees every day as an opportunity to promote the dignity of all human beings and gender equality. March 4, World Day of the fight against Sexual Exploitation, was an important opportunity to raise awareness of the NGO's activities; as was March 10, the anniversary of the birth of Savitri Bhai Phule (1831-1897), who started the first girls' school in India (1848) and was a social reformer committed against caste and gender discrimination. On March 8th, it was obviously International Women's Day; while on March 24th the International Day for the Right to Truth on Human Rights Violations and for the dignity of Victims was celebrated; March 25 is International Day of Remembrance for the Slavery and Transatlantic Slaves of Slaves, renewed today for the many women and girls still treated as slaves. For all these reasons, a round table was held in Ravulapalem on March 23rd with the participation of women leaders from the surrounding villages and the "Mandala" committees to combat discrimination, together with some men active in awareness-raising activities and social promotion of women. Through the interventions of various speakers, who interpreted the themes of the different days, the guiding theme of the round table - #Balanceforbetter - was discussed, concerning the path to be taken towards authentic gender equality. Among the numerous speeches there were those who recalled the precious role of Human Rights Clubs in educating girls to assert their rights; there were those cited the example of the new saint Óscar Arnulfo Romero for the battle of justice; and those who presented different, touching testimonies on the condition of slavery experienced by so many domestic workers in the Gulf countries. The meeting concluded with the commitment of the participants to support the campaign to make their villages in places with a "zero" incidence of domestic violence and sexual exploitation. Das flew in from Kolkata to attend the funeral of Father Thaiparambil, who rescued him from a street in the eastern Indian city when he was barely six years old. “I have not seen God, nor have I seen my parents. But if God is there, I am sure he looks like this man,” he said after the ceremony. The priest helped at least 80,000 children like Das to leave the streets and secure a decent life, Salesian officials said. Father Thaiparambil began his work with street children in Kolkata, formerly Calcutta, three decades ago in 1985. Das was one of the initial beneficiaries of his mission. The 84-year-old priest died in New Delhi of an age-related illness on March 19. About 500 people including former street children attended his funeral officiated by Archbishop Anil Couto of Delhi and retired Archbishop Vincent Cocessao of Delhi. Condolence messages recalled how Father Thaiparambil witnessed the misery of children wandering the streets of Kolkata, particularly near Howrah railway station, and decided to work for them. He opened his first night shelter for 14 street children in a slum area near Howrah and began to live with them. St. Mother Teresa of Kolkata blessed his second shelter, which he named Ashalayam (house of hope), in 1991. She also blessed his third shelter in 1995. About 500 street children now live in 23 Ashalayam shelter homes in Kolkata and Nadia district of West Bengal state. After moving to New Delhi in 1995, Father Thaiparambil opened three shelter homes in Delhi, Haryana and Uttar Pradesh. Das said the priest gave him “a life, an identity.” He had no name. Children around him called him by nicknames they liked, he said while trying to control his emotion. Das now works with the government’s “Child Help Line”, a project to help street children. He continues to live in the shelter where he grew up in Howrah. Father Thaiparambil, from the southern state of Kerala, joined the Salesian congregation in 1950. After he completed a master’s degree in social work, he was assigned to work for youth and children at risk in Kolkata. Deepak Kumar Johnny, a street child rescued by the priest from New Delhi railway station, said he used to sell popcorn on the railway platform, where he also ate and slept along with other homeless children. “On a cold winter day, I was sleeping on the platform covering myself with newspaper. I felt someone cover me with a blanket. That was my first interaction with father,” he recalled. Johnny, who uses the name the priest gave him, is now 35 and married with two children. He said Father Thaiparambil started to visit the station regularly with food and clothes and slowly the children agreed to go to his ashram. “I am lucky and privileged that I was the first person to enter Ashalayam in 1991 in New Delhi,” he said. The priest educated Johnny and trained him to be a social worker. He now works in the church-run Holy Family Hospital and volunteers to help Ashalayam rescue children from Delhi’s railway and bus stations and streets. India had about 11 million street children in 1994, according to UNICEF, but activists say this number is a gross underestimate. (ANS – Rome) – “We know how much Don Bosco loved maps of the world. He would pore over them and refer to them, especially at a time when his horizons had gone well beyond Piedmont, and what was coming together as 'Italy' in the second half of the 19th century, to the wider world of souls to be saved, young, old, indifferent, and especially souls as yet unenlightened by faith in Jesus”. It was Plato, who in one of his “Dialogues”, described the sphere of the world as something that a soul, ascending in a moment of supreme transcendence, might behold as fashioned “of colours more numerous and beautiful than any we have ever seen”. Then we have the famous Mappa Mundi (the largest of which, dating back to some time in the 1300s, is preserved at Hereford Cathedral in England). Measuring 1.59 x 1.34 metres, the map is constructed on a single sheet of vellum (calf skin). Clearly within a Christian context, Jerusalem is at the centre, East is at the top. East, where the sun rises, was where medieval Christians looked for the second coming of Christ - when all geography would cease to be relevant! So, the Salesians in the World map fits somewhere between these two notions, borrowing something of the beauty of the former and the saving significance of the latter -- 'Holiness for you too' is featured prominently as a reminder at the top. The Salesians in the World map is a Miller projection map, regarded these days as a successful compromise avoiding the extremes of the Mercator projection (though, interestingly enough, these showed up largely in the Arctic and Antarctic, neither of which appear in our map for obvious reasons!). It contains a wealth of information, a kind of mini 'Annuario' or Yearbook (it is based on Vol. 2 of the 2109 edition of the latter), enabling one to find a quick statistical summary of nations, provinces, houses, Salesians in their various categories, presented in at least two ways, one of which indicates the city where the provincial house or centre is located. There is even the ubiquitous QR code. Download your own personal copy today! For further information on availability, contact the bosco.link webmaster via eao@bosco.link. It was January 31, 1944, the feast of St. John Bosco, when the publishing house SEI was first established - Sociedad Editora Ibérica being its first name. The idea came from the then Rector Major, Fr Pietro Ricaldone, who had entrusted it to the Salesians Fr Miguel Riera and Fr Romulo Piñol. With the support of the Salesian bishop Marcelino Olaechea, the Council of SEI was established, placed under the presidency of Ángel García de Vinuesa, a past pupil of the Salesians of Utrera. Throughout these 75 years, the CCS has specialized in the publication of pastoral and catechetical books, education, social action and all things Salesian. Based in Madrid, it boasts an editorial catalogue of almost 4,000 titles. It also publishes several magazines, such as the National Salesian Bulletin, Misión Joven, Catequistas and Cuadernos de Formación, with a circulation of around 620,000 copies per year. Hundreds of authors have chosen this publisher to publish their works. Since its inception, the CCS has also promoted the distribution of its books outside Spain, with special attention to Latin America. Currently, the CCS publisher, in addition to publishing books, organizes activities aimed at educators and pastoral workers, events such as days of formation and meetings between authors and readers. It also produces various religious items, all this for a single purpose: to continue to be at the service of education and faith. To celebrate 75 years of service, the publishing house has prepared various activities over a period of several months. In October 2018, a drawing competition for children was launched, entitled "Imagina a Don Bosco hoy", while in October 2019 the theatrical performance for children "El estanque de las Estrellas" is set to be staged. Another initiative is the renewal of the website - www.editorialccs.com – "of a functional and intuitive design." Other events that have already taken place: the book presentation of San Francisco de Sales, profeta y doctor del amor by Fr Eugenio Alburquerque, SDB; and the conference of Fr Rossano Sala, SDB, Special Secretary for the Synod of Bishops on Youth. At the height of all the anniversary activities is, as said, the institutional meeting of tomorrow, 6 April, presided over by the Rector Major. Venezuela – "The limiting of access to water is what could transform this situation into a health-related catastrophe". Message of Bishops: "I am thirsty"
(ANS - Caracas) - The humanitarian crisis in Venezuela is becoming increasingly critical. A news item, reported by CNN, describes the humanitarian catastrophe produced by a government that perpetuates itself without meaning: "The woman of my life died because there was no assistance in the hospital, because they had no medicine." The Presidency of the Venezuelan Episcopal Conference has launched a new message entitled: "I am thirsty", articulated in three points: "Reaffirming the dignity of the human person and their inalienable rights; crimes against humanity; the necessary conversion." "It hurts to see the terrible image of a mother carrying her daughter's body to the morgue, a child who died during the blackouts. It hurts to see dozens of children buried because there was no medicine or electricity to save them. It hurts to see the scene of thousands of Venezuelans who have to travel thousands of miles in search of a future." "More than the lack of electricity, it is the limitation of access to water which could turn this situation into a health catastrophe in the near future," said Susana Raffalli, a consultant with the Caritas Foundation. The concern of the Church at this time is fundamentally that of "reaffirming the dignity and centrality of the human person." They also denounce and deplore the crimes against humanity that have taken place in the country "under the complacent gaze of the authorities" and of the National Armed Forces, who ignore the teachings of the Constitution. Among the crimes, the bishops cite "the forced deportation of Colombians and Venezuelans, without following the procedures of the law", "incarceration or other serious deprivations of physical freedom", "torture against political prisoners", "deprivation of access to food and medicine", and "the people vanishing by force." In their message the bishops also expressed their "deep concern" for the "recurring blackouts at the national level which, among other things, further aggravate the crisis of the administration and conservation of food and medicines." The CEV affirms to be united to the "clamor of the people" and before "the existing ungovernability that has its root in the illegitimacy of the regime. It is necessary to recognize the legal and moral legitimacy of the National Assembly to undertake paths of understanding and solutions." (ANS – Rome) - With four new members from Paraguay, Argentina and the Philippines joining the Don Bosco Green Alliance on 3 April 2019, this global Salesian platform now has over 100 members! This is significant, because the alliance was launched in April 2018 and in the span of just one year it has 103 registered members from 35 different countries. Membership to the alliance is open to all Salesian institutions and organizations worldwide. Don Bosco Green Alliance is working to create an environment that is safe and caring for all life on the planet, while building up a new generation of environmentally committed citizens and leaders. The first year of DBGA has been very eventful, with members of the green alliance being involved in various programmes collectively. World Clean-up Day, celebrated on 15 September, saw several Salesian institutions that are part of the alliance, involving young people in clean-up activities, both, in their own campuses as well as in their neighbourhoods. ‘Salesian Youth for Climate Action’ was another global campaign by DBGA, from 15 November till 14 December, to raise awareness about COP24 and also to give young people the opportunity to express their views on the climate crisis. As part of this campaign, social media platforms such as Facebook, Twitter and Instagram were used to carry video messages from young people in Salesian institutions to world leaders meeting in Katowice, Poland. A key moment of the past year was the presence of DBGA representatives at the conference ‘Saving Our Common Home and the Future of Life on Earth’, organized by the Vatican Dicastery for Promoting Integral Human Development, to celebrate the third anniversary of the publication of Pope Francis’ encyclical Laudato Si’. This conference, held over two days on 5-6 July at the Vatican, opened with a panel of five young people presenting their views on the environmental crisis and their personal reflections on the impact of Laudato Si’. Macson Almedia from DBGA was one of the five young persons on this opening panel. Another important event was the launching of the Laudato Si’ Generation on 25 January during the celebration of the World Youth Day in Panama. DBGA was one of the founding members of Laudato Si’ Generation. 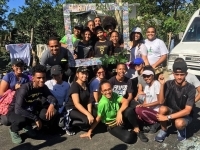 Laudato Si’ Generation, which is the youth branch of the Global Catholic Climate Movement, aims at becoming a global youth movement that works for environmental issues, especially climate justice. (ANS - Rome) - "Dear Mr. Minister Matteo Salvini, every year our family-type communities welcome and accompany towards adult life dozens of adolescent boys who cannot live in their families of origin for serious reasons and as established by the Minors Courts." Thus began the message that Fr Giovanni D’Andrea, president of “Salesians for Social - SCS / CNOS Federation”, addresses to the Italian Minister of the Interior Matteo Salvini. The minister, speaking at the International Congress of Families in Verona, spoke of "the business of hundreds of millions of euros" of the family homes. "With them," continues Fr Giovanni D’Andrea, "we do personalized educational paths that prevent further situations of psychological distress, deviance, premature school leaving and frailty, and we foster global growth and inclusion as active citizens in our society. Every day educators, volunteers, and families collaborate with a much greater use of forces than what the so-called 'fee or cost' (sometimes provided by some local authorities with great delay) provides to accompany these children and to offer them an opportunity for the future that all the other children with a family behind them have. Article 3 of the Convention on the Rights of the Child states that any action in favor of this category of people must be made in the best interests of the child. In light of this, they should first be listened to and how they do in the communities verified via their own live voices." "For this reason, Minister, we ask you to come to see for yourself and get to know the boys and those who look after them. Our children need people who are close to them as significant adults, and in this our educational commitment is fulfilled in the wake Don Bosco started over 150 years ago. An educational commitment that sees them as protagonists. We wait for you to see for yourself, become aware in person, and thus be able to communicate to all the careful educational work that is being done with them and for them." Salesians for Social - SCS / CNOS Federation supports and follows children in 46 residential communities throughout the country, accompanying them become significant adults. (ANS – Bangalore) – The Office of Development of the Province of Bangalore (BREADS – Bangalore Rural Education and Development Society) has made significant progress in the rehabilitation of homes and livelihoods in the wake of flooding that devastated the Indian state of Kerala in August 2018. The flooding from the heaviest rains the region has seen since 1924 left more than 400 dead in Kerala alone and close to 1,000 total. After initial support was provided in the immediate aftermath, Salesian missionaries with BREADS began making a long-term plan for rebuilding in the region. They launched a #RebuildKerala campaign to mobilize human resources and support from Don Bosco institutions for the huge task of cleaning up houses, public institutions and neighborhood areas to help people return to their homes. Don Bosco formation houses (seminarians), colleges and high schools were engaged in the clean up campaign. Volunteer groups of youth, students and staff of Don Bosco institutions and youth centers reached out to 38 villages, cleaning 408 houses, three government offices/PRI institutions, one church and one retreat center. BREADS was also successful in reaching out to graduates of Don Bosco institutions in Bombay and Bangalore who banded together to support the people of Kerala. A “Student to Student” campaign was launched in which children donated notebooks and education materials. The Don Bosco School in Matunga and the Dominic Savio School in Andheri also donated educational supplies for children affected by the flood. BREADS, along with its partners, also engaged the ITI students at Don Bosco Sultan Bathery and Don Bosco Kottiyam in restoring electricity and plumbing to people’s homes. This was a tremendous boost to the effort to bring a sense of normalcy back to people’s lives, especially when skilled resources were very scarce and expensive. The students reached out to temporary shelters and homes, bringing light to 200 houses in Wayanad, Aranmula and Ranni and 76 houses in the Pathanamthitta district. Within a month of the disaster, BREADS was ready to provide rehabilitative support to help people move on with their lives. With BREADS support, local Don Bosco institutions identified 90 families and purchased supplies and other necessities that helped local family farms and other small businesses sustain their livelihoods. (ANS - Rome) - Thinking about the work of young people is part of the Salesian DNA. But the challenge is to understand what work actually is today. For this reason, the women-focussed Centro Italiano Opere Femminili Salesiane – Vocational Training (CIOFS-FP), now celebrating its 50th anniversary, has organized a two-day event of celebration and reflection: this morning, 3 April, a delegation from the institution participates in the audience of Pope Francis, and in the afternoon a meeting session is scheduled on the pedagogical and historical-charismatic meaning of CIOFS-FP; tomorrow, the institutional assembly itself. The history of the Vocational Training of the Daughters of Mary Help of Christians (FMA) is as old as the Institute itself: in the first houses founded, next to the oratory, there was always the "Family Workshop" for young people and girls wherein the art of sewing at various levels was taught. In 1950, there were as many as 600 of these laboratories! At the same time, "Evening Schools" emerged for young women prematurely employed in factories. This was followed by the schools for rural housewives and then real and proper "agricultural schools". At the end of the 1960s, as "Artisan Schools", "Business Schools" and "Professional Start-up Schools" already existed, Sister Anita della Ricca gave life to the "CIOFS", of which she was the first National President, to give a civic or institutional aspect to all these works. Thus, the CIOFS Vocational Training Centers were born. Even today, the CIOFS-FP has the objective of curating the vocational training of young people actively seeking opportunities in the world of work or supporting those inclined towards entrepreneurship. Today, however, there is a large gap between studies and the trades needed in the real world: the “blue collar” worker is now technological, the farmer greentech, the hairdresser must study trichology, and to produce machinery, besides engineers, many specialized technicians are required. For this reason, the courses for professions, if consciously thought of for the specific needs of the local productive districts, prove to be very useful. The centers of CIOFS-FP are scattered throughout Italy and after years of planning and development are growing, ensuring employability rates that often reach circa 90%. As regards concrete actions for this important anniversary, in the afternoon of today, April 3, starting at 3 pm, a commemorative session is scheduled to be broadcast on live streaming on www.ciofs-fp.org; the Superior General of the FMA, Mother Yvonne Reungoat, will also be speaking. Tomorrow, April 4th, the CIOFS-FP assembly is scheduled. (ANS - Santiago) - In March, to improve the quality of services and spaces for the students of the Silva Henríquez Catholic University (UCSH), the headquarters of the Salesian university in the "Lo Cañas" district of La Florida, a suburb of Santiago, opened the doors of its new facilities, now available to over 300 new students in the courses of Nursing, Kinesiology and Phonoaudiology, and those of Pedagogy in Physical Education. The project encompasses a total area of ​​about three hectares, made available by the Salesian Province to the UCSH. The construction work of this new reality, which began in December last year, includes 11 new classrooms, two Chemistry and Biology laboratories, as well as the extension of the boarding school, theater redesign and new offices for academic staff. In this regard, the Rector of the UCSH, Fr Galvarino Jofré, underscored that "among our future projects we are planning to develop a Family Health Center, similar to the one we have in the Central House, which could be connected to the Study and Attention Center of the Community (CEAC) or the Legal Clinic, which answers to the needs of the population that surrounds us and can become a truly significant contribution to this sector, given that this service is currently lacking." The Rector also thanked all the people who actively participated in the project. "There's a great team here. And I am also very grateful to the Province for providing these spaces to the University." For his part, the Dean of the Faculty of Health Sciences of UCSH, Prof. Miguel Acevedo, commented: "We are in a privileged environment, which allows us to develop academic activities in a very good way, demonstrating all the commitment and the will of the University to offer the best to our students." While the Director of Physical Resources at UCSH, Patricio Hevia, stated that "at our Management Board, we are very happy, because we have seen the work at the beginning, from scratch, and today everything is completely different, improved. There is a lot to do, but from my point of view, we are taking a big step forward that will benefit students." It should be noted that the team from the Student Affairs and Ministry Directorate (DAE), which welcomed and guided the new students, also attended the opening day on 11 March. India – Fr Á.F. Artime to the Salesian Family: "Our mission is to bear witness"
(ANS - Panjim) - "Do you have a warm heart? ... Be generous, there are many young people who do not have your structures and opportunities. Go forth to meet them!" These are some of the words that the Rector Major, Fr Ángel Fernández Artime, addressed to the young people of the Salesian Youth Movement, Sunday 31 March, at the Salesian Institute "Don Bosco" in Panjim. "You must spread Salesian joy to others ... Do not be sad, Christians with a suffering face," added the Successor of Don Bosco before the young. Throughout the meeting, the Rector Major showed great affability, a paternal trait and a willingness to answer questions and requests from the young participants. During the morning, Fr Á.F. Artime met the young Salesians in initial formation and the prenovices; in the afternoon, at the Provincial House of Oxdel, he gathered with members of the Salesian Family for a new moment of sharing in the Salesian spirit. "We all have only one father, Don Bosco, and his charism is our mission," he said, recalling that the Salesian Family is like a big tree with, so far, 32 branches. He then used an example from the Saint of Youth and Pope Francis to remind participants of two fundamental aspects. The first is that the Salesian Family works together with whoever is available: "Don Bosco called everyone to work with poor young people, including his mother, Mamma Margherita, also the mother of Father Rua, also the mother of Giovanni Cagliero ..."
The second, to put onself at the service of everyone: "What does the Church expect from you? Pope Francis said that the Church does not condemn other religions, the doors of the Church are always open to everyone. We are not here to protect ourselves from anyone. Our mission is to bear witness and the Gospel should accompany everything we do." Furthermore, he recalled the specific mission of groups composed essentially of lay people: "You are apostles in the world, scattered like a forest. You must flourish and bear fruit wherever you are planted!" Yesterday morning, April 1st, the Rector Major celebrated the Eucharist on the tomb of St. Francis Xavier, patron of missions, and visited the ancient part of Goa. "I thank God for Saint Francis Xavier. I thank God for the many Salesian missionaries who work in difficult conditions. They bore witness and still bear witness today to the real life of Christians," he declared during Mass. As the last act of his visit, as if to seal the days of the Animation Visit to the “San José Vaz” Province of India-Panjim (INP), he met with the young people at risk and in street conditions welcomed at the center of Ucassaim-Paliem. There he was able to admire the simplicity of the work and life of the Salesian community, and he was welcomed with great joy by the beneficiaries of the house, who had just taken the final exams of the year and still had their uniforms on. And, as Don Bosco would have said, the Rector Major told them: "In your midst, I am very happy." (ANS - Buenos Aires) - On 1 April, the Club Atlético San Lorenzo de Almagro celebrated its 111th birthday. Among its fans is none other than Pope Francis, holder of membership card number: 88235N-0. The "San Lorenzo", as it's more commonly called, was established in the city of Buenos Aires, and precisely at the "San Antonio" festive oratory directed by the beloved Salesian priest Lorenzo Bartolomé Martín Massa. The Salesian priest wanted to offer his boys a new recreational space. According to Fr Massa himself, the colors of the team's shirt were taken from an image of Mary Help of Christians he kept in the oratory. It all started with some youngsters from the neighborhood of Almagro who had started to meet in the street to practice that new sport played with feet: football. They would play at the intersection of México and Treinta y Tres Orientales, in the neighborhood of Almagro. It was on the soccer field of the "San Antonio" oratory that the San Lorenzo played its first friendly matches, always on condition that its young players would participate in Sunday Mass. The club slowly grew and Fr Massa was sent to continue his work of evangelization with other assignments at other destinations. And yet, even so, Fr Massa was always attentive to the club of his boys and those who continued to pass through his oratory. Fr Massa died in Buenos Aires on October 31, 1949. A few days later, Fr Raul Entraigas, spiritual assistant of the San Lorenzo de Almagro club, wrote: "His love for the San Lorenzo de Almagro club was his life and his death, his joy and his drama. San Lorenzo was his spiritual son. Fr Massa did not love it as a father, but as a mother. He rejoiced for its triumphs and suffered for its defeats." Today the San Lorenzo de Almagro is one of the main Argentine clubs and its activities have expanded, including, in addition to football, other disciplines, such as basketball, volleyball and hockey. And among the many fans, it also boasts the Successor of Peter, Pope Francis. India - Rector Major: "Education is a wonderful garment that will give young people a future"
(ANS - Panjim) - The long-awaited visit of the X Successor of Don Bosco, Fr Ángel Fernández Artime, to the Salesian Provincials of India-Panjim is matching the high expectations of the local Salesian Family. On his journey of knowledge and animation to the various Salesian houses, the Rector Major is bringing enthusiasm and words of orientation to current challenges. On Friday 29 March, Fr Á.F. Artime visited the "Don Bosco" educational institute in Panjim. Welcomed with great joy and affection, he reciprocated by offering important prompts to all: to the students he suggested they make the most of their time at the Salesian Institute and in the future to continue to contribute to the good of the nation and of humanity; to the teachers, he expressed his gratitude for sowing something beautiful in the hearts of their students every day; he reminded the Salesians and staff that all together it is possible to fulfill the great dream of Don Bosco. And before leaving, he also told the students that he would like to spend the whole day there among the young people, if the program allowed him to do so. Subsequently, the Successor of Don Bosco continued his visit by celebrating the Eucharist with his confreres and then meeting with them for a moment of fraternal dialogue. Lunch time was also significant: during the fraternal agape, in the presence of numerous members of the local Salesian Family, the Rector Major got to know also the Prime Minister of the State of Goa, Pramod Sawant, accompanied by other parliamentarians and Indian authorities. In the afternoon, he then visited the “Auxilium Caranzalem” center of the Daughters of Mary Help of Christians: honored with flowers and songs on his arrival, he encouraged the religious in their service for the young, the poor and the marginalized. Before leaving for the provincial center, there was still time for a moment of authentic fraternity around tea, with songs and a frank and sincere dialogue. Saturday, 30 March, began with a visit to Pinguli and continued with the inauguration of the Loutolim prenovitiate. Then the X Successor of Don Bosco animated a large party of young people at the Faculty of Engineering of the Don Bosco Institute in Fatorda; he answered the students' questions, saw them perform, danced with them and was available for all photo and selfie requests. During the afternoon, accompanied by the Provincial of India-Panjim, Fr Felix Fernandes, he met with journalists for a press conference. He explained that he is trying to visit the Salesians throughout the world to make his paternal presence felt, and that so far he has visited 87 countries of the 134 that welcome Don Bosco's spiritual Sons. He also said he was in India for the fourth time, calling it "a very diverse, rich and wonderful country, like a continent with 26 different languages." "The Salesians who have been working here for over 40 years have seen enormous changes," he continued, but stressed that there are still strong contrasts, which is a challenge for India and beyond. "Education is a wonderful suit (or dress) that will give young people a future," he added, also stressing that it develops peace and counteracts terrorism, and that 70% of Salesian pupils in India are non-Christians. Finally, he also addressed the problem of drugs, a problem of global significance, against which the Salesians fight with their traditional weapons: prevention and education. Fr Á.F. Artime finally concluded the day by concelebrating the Eucharist in the Shrine of Our Lady of Fatima, in Panjim, together with the archbishop of Goa and Daman, Msgr. Filipe Neri Ferrao, and the bishop of Sindhudurg, Msgr. Alwyn Barreto.